The Giraffe* Incubator Carestation* combines advanced technology creating the Path to Positive Growth and Neurodevelopment. 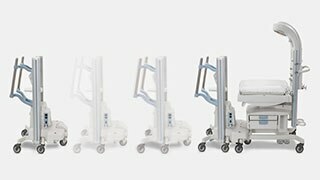 Combining innovative technology with exceptional thermal performance, the Giraffe Incubator Carestation is a state-of-the-art neonatal environment that promotes natural, peaceful healing, while fostering a close bond between families and their babies-allowing them to be present for every step of the journey. Additionally, physicians have improved access to their smallest patients, giving them a better chance at providing successful treatment, the very first time around. Safeguard from infection with advanced features and hands-free alarm silence: This is an important topic in the NICU. The Giraffe Incubator Carestation is designed not to promote bacterial or fungal growth1. 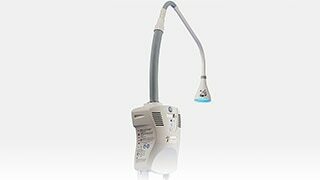 The hands-free alarm silence allows caregivers, with a wave of hand, to turn off the alert eliminating unnecessary procedure interruption and baby stimulation. When paired with the Giraffe Shuttle, the Giraffe Incubator Carestation provides continuous warmth during intrahospital transport, in addition to promoting the growth and stability of even the most fragile of patients. Our Giraffe Incubator Carestation has connectivity capabilities which allow communication with electronic healthcare records and hospital information systems. An innovative offering based on total cost of ownership establishing to partner with customer on the long run and including 2 years of service coverage. Every part of the Giraffe Incubator Carestation was thoughtfully engineered to enhance the care experience, while providing the best possible neuroprotective environment for the newborn. If either door panel is opened, Air Boost can be easily enabled to protect the baby from heat loss and support thermal stability. 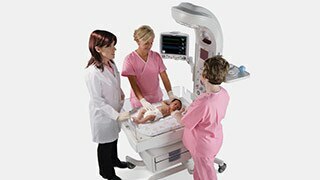 Thanks to the patented Baby Susan* technology, clinicians can easily reposition the baby, reducing negative touch and stimulation, while improving procedural success. Additionally, the mattress is pressure diffusing, thus reacting to the impact of the baby’s body and adjusting accordingly, to reduce stress and improve comfort. Stay up-to-date on all your patients’ medical history with a system that can be connected to electronic healthcare records and hospital information systems. Note: This technology is equipped for future updates and upgrades. 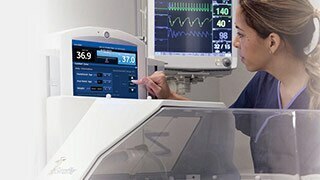 10.4“ color display touchscreen helps caregivers streamline information and control the baby’s environment, while making important information readily available to eager family members; contributing to the personalized patient and family-friendly care environment. With the wave of a hand, clinicians can quickly silence alarms, making it easier to provide immediate care, while maintaining a calm, soothing environment for the baby.